Why Choose Remanufactured Ink Cartridge for Your Inkjet Printer? 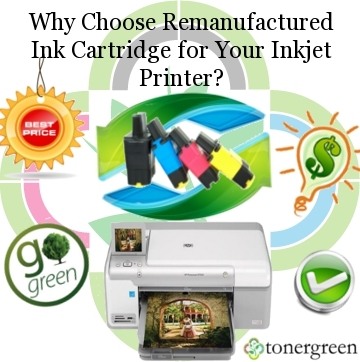 | TonerGreen - Eco-Friendly Toners from the U.S.
Why Choose Remanufactured Ink Cartridge for Your Inkjet Printer? Inkjet printers is a type of printer that produce digital image by propelling droplets of ink onto paper either thru the following technologies; (1) continuous inkjet commonly used for marking and coding of products and packages (CIJ, (2) thermal (thermal DOD inkjet) mostly found in Hewlett Packard, Canon and Lexmark printers and (3) piezoelectric (piezoelectric DOD inkjet) used by printers produced by Epson and Brother Industries. Inkjet printers are more popular for home users; that's why they are sometimes referred to as common household printers. These inkjet printers are also popular for printing quality photographs and other image documents better than laser printers can. But since inkjet printers use inkjet cartridges that contain ink, they are likely to be used up faster than laser toner cartridges thus having a higher per-page-cost than laser printers. Fortunately, third-party companies had developed a way to provide inkjet printer users with quality ink cartridges at the low price using the remanufacturing process. Remanufacturing is the process of disassembly and recovery at the module level, and eventually, at the component level. This process is applied to empty or used OEM inkjet cartridges sent to third-party manufacturers. Remanufactured inkjet cartridges are refurbished OEM ink cartridges that are refurbished and re-filled with new quality ink then went under several quality control processes to ensure that they meet the quality and page-yield of their OEM counterparts. Manufacturers of remanufactured inkjet cartridges usually provide a list of all benefits that these products can give. Some of these are high-quality printing that can be comparable to OEM inkjet cartridges, savings up to 70% of your printing expenses and environmental benefits because remanufactured printer supplies apply recycling processes that help preserve virgin materials from nature and energy. At TonerGreen.com, we offer a wide selection of U.S. made of remanufactured ink cartridges and remanufactured toner cartridges that are both planet-friendly and pocket-friendly for known printer brands like HP, Brother, Canon, Dell, Epson and Lexmark printers. Our products are not just ordinary recycled cartridges, quality is strictly imposed every step of the remanufacturing process until our products are either picked up by the customers or shipped to their address. Plus, all our remanufactured ink cartridges are backed by 100 % satisfaction and performance guarantee that is comparable with what OEM manufacturers offer. Remanufactured ink cartridges are not only a great way to join the "Go Green" revolution, but also a good way to save that hard-earned dollar. Remanufactured inkjet cartridges will be completely cleaned and filled with quality ink.So we use remanufactured inkjet cartridges. Thanks.